A truly fantastic performance from 3rd and 4th class who are crowned Futsal champions for the first time in the schools history. Games were approx. 15 minutes with the top team in each group progressing to the cup competition. Greystones (A) finished first in their group and progress to the cup. Greystones (B) finished second in their group and are eliminated. The top two teams progress to the final, as well as qualifying for the South Leinster Cup. Congratulations Greystones (A) on qualifying for the South Leinster Cup. The top two teams in the group play off in the final for a pace in the All Leinster Finals. Commiserations to Greystones on losing the final but congratulations on achieving the schools best ever result at the competition and finishing runners-up in South Leinster. Games were approx. 15 minutes with the top team in each group going through to the semi-finals. Greystones (A) finished second in their group on goal difference. 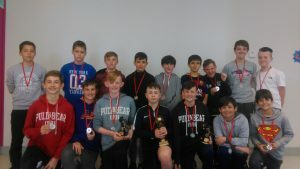 Greystones (B) finished second in their group. Unfortunately, neither team progressed to the next stage. Both teams represented the school proudly ad performed to their best on the day. After a very competitive set of trials, taking place over a number of days in January, we ended up with 16 pupils from 4th-6th class who will go on to represent the school in the Wicklow section of the Spar FAI 5 a side soccer competition in March. We set off just after 9am to Lamberton, Arklow in good spirits, ahead of what was sure to be a series of difficult games. The new GETNS jerseys worn for the first time, looked great in the sunshine, as the draw was made for the group stage of the competition. Games were approx. 15 minutes with the top two from each group going through to the semi-finals. Greystones (1) finished top of their group on goal difference with a total of 10 points. Congratulations G.E.T.N.S who have qualified for the the Leinster finals as one of the top two teams!! We were drawn in the same group as Tullow N.S., Rathgarogue N.S., and Castlebridge N.S. with the top two going through to the semi-finals. Greystones (1) 0-2 Tullow N.S. After some extremely hard fought games, where we were unlucky to come out on the losing side, we finished with one point from the group stage and exited the competition. 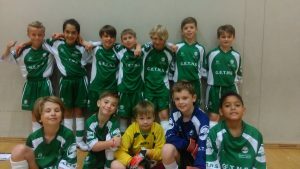 A massive congratulations to all 16 children involved who did the school proud in both their effort and sportsmanship. I would like to thank the 6th class children and wish them the best of luck as they move onto secondary school and look forward to next year where we will try again to go as far in the competition as we can.